"Derivative" is the first word that comes to mind when describing Oblivion, the latest sci-fi actioner from Joseph Kosinksi (TRON Legacy, and we all know how that turned out). "Convoluted" has a strong hand here, too, but all of that is screenplay-based. Kosinski's execution is right on, and Oblivion, cliched and overcomplex as it is, strikes a very early, very entertaining summer chord here in 2013. With Tom Cruise, action star extraordinaire, at front and center, Oblivion blasts away before your eyes, keeping your brain occupied so it's not focusing on the flaws. You know, like all good, summer blockbusters do. More below! Cruise stars as Jack Harper, part of a two-man crew here on Earth over 70 years in the future. Many years before, an alien invasion left our moon destroyed and nearly wiped out the planet. We won the war, but our planet was left uninhabitable. 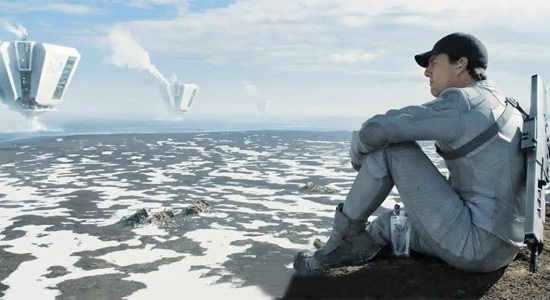 Harper and his partner (and lover), Victoria (Andrea Riseborough), manage the drones, giant machine gun turrets that fly around the planet taking out what's left of the alien race still scattered about, and ensure the water extractors continue churning the last of Earth's supplies up to Titan, the human race's new permanent residence. With two weeks remaining before Harper and Victoria join the rest of the humans on Titan, a strange beacon and an even stranger crash-landing has Harper questioning what happened to his planet, what his strange dreams of a woman in New York City really mean, and as with almost every hero, who he really is. It's all the great, sci-fi questions wrapped up here in one, shiny package. Oblivion's screenplay, based on a graphic novel Kosinski co-wrote, speeds through its story at about a hundred-ideas-per-minute with many of the elements placed here seemingly because their staples of sci-fi storytelling. Harper's strange dreams are only the start of it. It's not rocket science to figure out Melissa Leo as "The Woman Who Talks To Our Protagonists Through A Computer Monitor" isn't telling them everything she knows. It's also not too difficult to realize there's more to Morgan Freeman as the leader of a strange band of rebels than just one-note villainy. Fortunately, Kosinski's handling of his own material ends up helping the material itself, never trying to make certain twists in the story much grander than they really are. A few of the twists Oblivion takes are easy to sort out well before they happen, but it does end up surprising a time or two. What's most surprising about the film is how stunning it all is to look at. Kosinski knows art design, and the world he crafts here is both interesting and beautiful. From the giant ocean-based water extractors we see off in the distance to the half-demolished Moon that hangs still in the night sky to the Tet, a monolith of a space station that circles the planet, the imagination at work in building this future Earth is a spectacular one. What's more, Kosinski litters this world with some serious, summer blockbuster-level moments of adventure. Once the mystery of it all subsides a bit and Oblivion is allowed to be an action extravaganza, it does just that. Kosinski moves his story from scene to scene, action beat to action beat until the viewer can't help but be swept up in it all. There is a 30 to 40-minute sequence of events in Oblivion's second act that bounces from action set piece to stand-off to chase to another stand-off, and there's probably another action set piece that follows shortly thereafter. If the story can't hold your interest or if it gets too wound up in itself for you, at least the action Oblivion brings in its back half is there to knock you out of the park. And what better actor in 2013 is there to watch go through all that blockbuster-style action than Tom Cruise? Let's not even mention his age, because it's never a factor. Cruise delivers time and time again whether the actual film delivers or not. Fortunately, Oblivion has a well-crafted and conflicted character for Cruise to run with, and if you know Tom Cruise at all, you know the man loves to run. Hell, he's run a mile and a half since I sat down to write this review. But it's not all running and jumping and taking action hits from flying debris. Cruise always grabs hold of a character's drama if it's there to take, and the genuine emotion and range he brings to Jack Harper is undeniable. 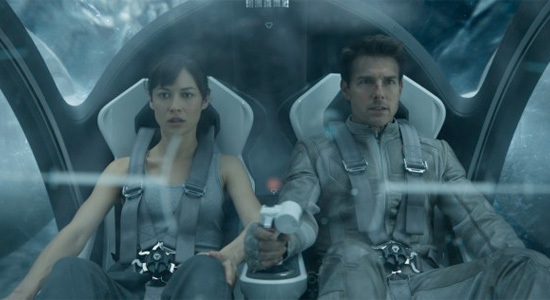 The secondary cast, those aforementioned and Olga Kurylenko as Harper's mysterious dream woman, are all solid, but the two brightest stars shining in Oblivion's night sky are Cruise and the vision of its director. Joseph Kosinski has a knack for bringing too much complexity to his stories. While Oblivion is never as incomprehensible as TRON: Legacy, it does dip its toe in convolution too many times. But when the film throws down the story gauntlet and picks up the ever-increasing pace, it becomes a charged blast of a film that leaves your entertainment appetite satiated. Oblivion gives us a fine example of the vision we're sure to expect from future works by Kosinski. Let's just hope he keeps it simpler in the future. Thanks Jeremy. I will have to check OBLIVION out this weekend. Well I personally think cruise has been on a role here lately. I loved jack Reacher, I hope he builds off the badassness in this movie as well. You mean on a 'roll'. I dont think he ever was not. Minority Report? Already a few years old. It was great stuff. War of the worlds wasn't that bad either. I dont care what his personal matters are (scientology etc) I have always since a teenager enjoyed his performances. I'd love to see what Konsinski could do with a good script and screen writer. I had zero issues with Tron Legacy in terms of execution, but the weak plot and awful dialogue pushed it into guilty pleasure territory. I want him to make a film that I can whole heartedly recommend to anyone. Even with Tron Legacy, what you liked about the film was most likely largely due to SFX and people's post-production work, not the director. I dunno, a lot of those decisions are made by the director, and while he may not have been directly responsible for creating that content, he's ultimately at the helm for making decisions on how those different elements are used and brought together. Half the battle is surrounding yourself with people that are good at their jobs. The trailer just seemed to walk me through the whole movie, so it kind of ruined it for me. I will eventually red box and force myself to forget what I saw. I wish they would make trailers that purposely left out the actually movie. Some folks need play by play I guess. Trust me, the trailer doesn't give away most of the movie. Ok, I will check it out on rental. My weekends are about to be filled up with the summer flicks! Seems like a fair quick review. On point. Lots of people ive talked to here in LA have said its mediocre at best. To be honest, i have not been hyped about this movie simply because Tron was so average. Looks like it still will deliver on a visual and music basis. Just looking for a fun ride..nothing more. Now Elysium on the other hand...D9 was awesome so im pretty sure E will rock! I quite liked it. But it was more popcorny in the end. Looked pretty good though. Do you sincerely think Olga Kurylenko's performance was "solid"? I thought it was mediocre at best - no chemistry between her character and Tom Cruise's, poor display of emotions, etc. Totally. No chemistry was present whatsoever. She was blank. Oblivion - I love Cruise but I can only give this a 6/10. Like Tron Legacy the visuals are sumptuous and the use of the soundtrack excellent. However I didn't really 'feel' it. Like the director had put all the pieces in place and just assumed that it would organically come together from the collective of it's elements. The action set pieces felt very stale and generic - 'the oh so narrow gap in the valley that traps the two chasing craft', 'the leader getting on the gun in a hopeless last act of defiance replete with offensive language retort', 'the fluffy haired kid introduced purely to add some feeling of peril to an action scene'... There was much that I wanted to like and I did think about it for some time afterwards but the actual experience of watching it left me a little 'meh'. I saw Oblivion yesterday on the IMAX screen. Good acting, cinematography and action. But the plot was transparently thin. I'd give it 7 out of 10. Only a 3 out of 10 from me. The characters are so shallow that you absolutely don't give a damn about them. The main purpose in making this movie seems to be for Tom Cruise and the Left Coast to give some kind of blunt political sermon against using drones strikes to kill ground militias who fight with their faces covered.